TAIPEI, Taiwan — REUTERS　｜　JULY 9, 2007 — Apple plans to launch a cheaper version of the iPhone in the fourth quarter that could be based on the ultra-slim iPod Nano music player, according to a JP Morgan report. Kevin Chang, a JP Morgan analyst based in Taiwan, cited people in the supply channel that he did not name and an application with the U.S. Patent and Trademark office for his report. Apple filed a patent application document that refers to a multifunctional handheld device with a circular touch pad control, similar to the Nano’s scroll wheel. Apple did not respond to requests for comment. 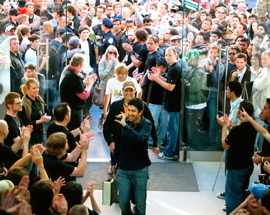 Long lines of people turned out on June 29 when U.S. sales began for the iPhone, a mobile phone with a music player and Web browser. Analysts have estimated that sales in the first weekend were as high as 700,000 units. 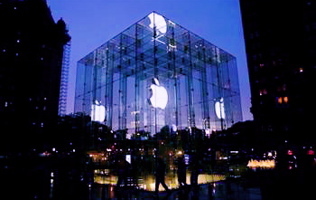 Because of the anticipated lower price, 2008 sales of 30 million to 40 million units “is achievable,” Chang said. This would be a much larger volume than is expected of the first iPhone, Apple has targeted sales of 10 million units in 2008, which would give it a 1 percent share of the global market. Sales of the iPhone are expected to be limited to a small percentage of the market due to its high price tag, particularly in the United States where 85 percent of consumers tend to spend $100 or less on cell phones. But analysts predict that a cheaper phone from Apple, which leads the digital music player market, could pose a much bigger threat to long-established phone makers such as Nokia, Motorola, Samsung Electronics and Sony Ericsson, owned by Sony and Ericsson. Is that SUPER HYPE real?.... It ain’t bragging if you done it. The iPhone is also an iPod. When in its U.S.B. charging cradle, the iPhone slurps in music, videos and photos from your Mac or Windows PC. Photos, movies and even YouTube videos look spectacular on the bright 3.5-inch very-high-resolution screen. The Google Maps module lets you view street maps or aerial photos for any address. It can provide driving directions, too. It’s not real G.P.S. — the iPhone doesn’t actually know where you are — so you tap the screen when you’re ready for the next driving instruction. But how’s this for a consolation prize? Free live traffic reporting, indicated by color-coded roads on the map. Apple says one battery charge is enough for 8 hours of calls, 7 hours of video or 24 hours of audio. My results weren’t quite as impressive: I got 5 hours of video and 23 hours of audio, probably because I didn’t turn off the phone, Wi-Fi and other features, as Apple did in its tests. In practice, you’ll probably wind up recharging about every other day. Apple says that the battery starts to lose capacity after 300 or 400 charges. Eventually, you’ll have to send the phone to Apple for battery replacement, much as you do now with an iPod, for a fee. So yes, the iPhone is amazing. But no, it’s not perfect. There’s no memory-card slot, no chat program, no voice dialing. You can’t install new programs from anyone but Apple; other companies can create only iPhone-tailored mini-programs on the Web. The browser can’t handle Java or Flash, which deprives you of millions of Web videos. The two-megapixel camera takes great photos, provided the subject is motionless and well lighted . But it can’t capture video. And you can’t send picture messages (called MMS) to other cellphones. Then there’s the small matter of typing. Tapping the skinny little virtual keys on the screen is frustrating, especially at first. Two things make the job tolerable. First, some very smart software offers to complete words for you, and, when you tap the wrong letter, figures out what word you intended. In both cases, tapping the Space bar accepts its suggestion. Second, the instructional leaflet encourages you to “trust” the keyboard (or, as a product manager jokingly put it, to “use the Force”). It sounds like new-age baloney, but it works; once you stop stressing about each individual letter and just plow ahead, speed and accuracy pick up considerably. Even so, text entry is not the iPhone’s strong suit. The BlackBerry won’t be going away anytime soon. Then there’s the Internet problem. When you’re in a Wi-Fi hot spot, going online is fast and satisfying. But otherwise, you have to use AT&T’s ancient EDGE cellular network, which is excruciatingly slow. The New York Times’s home page takes 55 seconds to appear; Amazon.com, 100 seconds; Yahoo. two minutes. You almost ache for a dial-up modem. These drawbacks may be deal-killers for some people. On the other hand, both the iPhone and its network will improve. Apple points out that unlike other cellphones, this one can and will be enhanced with free software updates. That’s good, because I encountered a couple of tiny bugs and one freeze. (There’s also a tantalizing empty space for a row of new icons on the Home screen.) A future iPhone model will be able to exploit AT&T’s newer, much faster data network, which is now available in 160 cities. 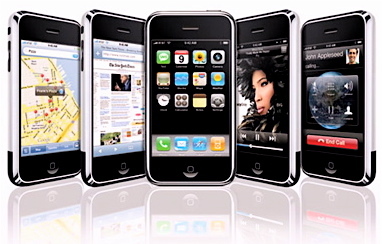 a cellphone, a wide-screen iPod, and an Internet communications device. JUNE 27, 2007 — Talk about hype. In the last six months, Apple’s iPhone has been the subject of 11,000 print articles, and it turns up about 69 million hits on Google. Cultists are camping out in front of Apple stores; bloggers call it the “Jesus phone.” All of this before a single consumer has even touched the thing. So how is it? As it turns out, much of the hype and some of the criticisms are justified. The iPhone is revolutionary; it’s flawed. It’s substance; it’s style. It does things no phone has ever done before; it lacks features found even on the most basic phones. Unless you’ve been in a sensory-deprivation tank for six months, you already know what the iPhone is: a tiny, gorgeous hand-held computer whose screen is a slab of touch-sensitive glass. 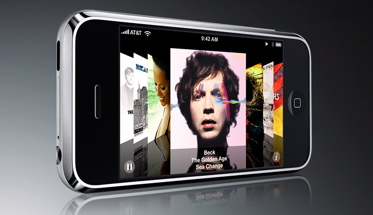 The $500 and $600 models have 4 and 8 gigabytes of storage, respectively — room for about 825 or 1,825 songs. (In each case, 700 megabytes is occupied by the phone’s software.) That’s a lot of money; then again, the price includes a cellphone, video iPod, e-mail terminal, Web browser, camera, alarm clock, Palm-type organizer and one heck of a status symbol. The phone is so sleek and thin, it makes Treos and BlackBerrys look obese. The glass gets smudgy — a sleeve wipes it clean — but it doesn’t scratch easily. I’ve walked around with an iPhone in my pocket for two weeks, naked and unprotected (the iPhone, that is, not me), and there’s not a mark on it. But the bigger achievement is the software. It's fast, beautiful, menu-free, and dead simple to operate. You can't get lost, because the solitary physical button below the screen always opens the Home page, arrayed with icons for the iPhone's 16 functions. You've probably seen Apple's ads, showing how things on the screen have a physics all their own. Lists scroll with a flick of your finger, CD covers flip over as you flick them, e-mail messages collapse down into a trash can. Sure, it's eye candy. But it makes the phone fun to use, which is not something you can say about most cellphones. Apple has chosen AT&T (formerly Cingular) to be the iPhone's exclusive carrier for the next few years, in part because the company gave Apple carte blanche to revise everything people hate about cellphones. For example, once the phone goes on sale this Friday, you won't sign up for service in a phone store, under pressure from the sales staff. You will be able to peruse and choose a plan at your leisure, in the iTunes software on your computer. Better yet, unlimited Internet service adds only $20 a month to AT&T's voice-plan prices, about half what BlackBerry and Treo owners pay. For example, $60 gets you 450 talk minutes, 200 text messages and unlimited Internet; $80 doubles that talk time. The iPhone requires one of these voice-and-Internet plans and a two-year commitment. On the iPhone, you don't check your voice mail; it checks you. One button press reveals your waiting messages, listed like e-mail. There's no dialing in, no password — and no sleepy robot intoning; “You...have...twenty...one...messages." To answer a call, you can tap Answer on the screen, or pinch the microscopic microphone bulge on the white earbud cord. Either way, music or video playback pauses until you hang up. (When you're listening to music, that pinch pauses the song. A double-pinch advances to the next song.) Making a call, though, can take as many as six steps: wake the phone, unlock its buttons, summon the Home screen, open the Phone program, view the Recent Calls or speed-dial list, and select a name. Call quality is only average, and depends on the strength of your AT&T signal. E-mail is fantastic. Incoming messages are fully formatted, complete with graphics; you can even even open, but not edit Word, Excel and PDF documents. The Web browser, though, is the real dazzler. This isn't some pesky, claustrophobic My First Cellphone Browser; you get full Web layouts, fonts and all, shrunk to fit the screen. You scroll with a fingertip—much faster than scroll bars. You can double-tap to enlarge a block of text for reading, or rotate the screen 90 degrees, which rotates and magnifies the image to fill the wider view. Finally, you can enlarge a Web page—or an e-mail message, or a photo—by spreading your thumb and forefinger on the glass. The image grows as though it’s on a sheet of latex. MAY 30, 2007 — In the next year, Bill Gates will manage one of the highest-profile transitions in American business history — he’ll leave his day job as Chief Software Engineer at Microsoft, the $300 billion company he co-founded 32 years ago, and will move full time into philanthropy. But before he leaves, Gates has a few more high-tech projects to finish. 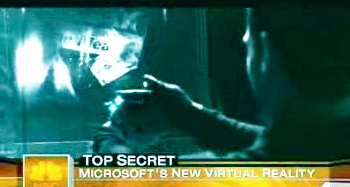 Until this morning, one project — almost five years in the making and code-named 'Milan,’ — was top-secret. 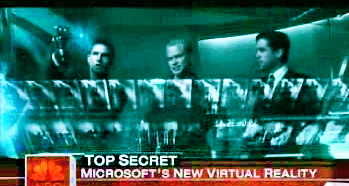 In a TODAY exclusive, I had a chance to talk with Gates at Microsoft’s Redmond, Washington campus about a revolutionary new device Microsoft now calls “Surface.” (MSNBC.com is a Microsoft-NBC Universal joint venture.) “Pretty exciting, eh?” Gates said with a sly smile, when he put his hand down on what looked initially like a low, black coffee table: At the touch of his hand, the hard, plastic tabletop suddenly dissolved into what looked like tiny ripples of water. 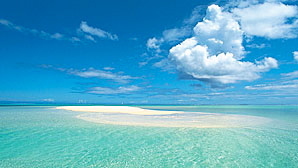 The ‘water’ responded to each of his fingers and the ripples rushed quickly away in every direction. “Go ahead,” he said. “Try it.” When I placed my hand on the table at the same time, there were more ripples. In an industry whose bold pronouncements about the future has taught me the benefits of skepticism, Surface literally took my breath away. If the Surface project rollout goes as planned in November, it could alter the way everyday Americans control the technology that currently overwhelms many of us. After Gates and I spent about 20 minutes taking the device out for a spin, a lot of my preconceived notions about how people interact with computers began to melt away. The radical new approach starts with the guts of the device itself. Under the impact-resistant plastic top skin on an otherwise nondescript table hide five infrared scanners, a projector, and a wireless modem. The scanners recognize objects and shapes placed on the top and respond to them accordingly. 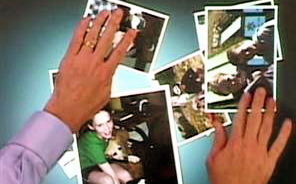 For example, if the scanners recognize fingers, and the fingers have been placed in color circles that appear on the surface, the projector shows colored lines that follow the tracings and movements of your fingers. Meanwhile, an internal modem sends and receives signals from any electronic device placed on it. 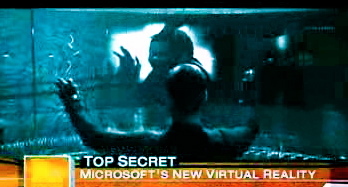 All of the hardware is run by a special version of Microsoft’s new operating system, Windows Vista. To do things on Surface’s tabletop screen, you reach down, touch it and push it. To make the image you see on the screen bigger, spread your fingers. To make it smaller, squeeze your fingers together. To move something into the trash, push it into the trash with your hand. And it allows what Microsoft calls “Multi-Touch” and “Multi-User” interaction — namely, more than one person can interact with it at a time. Try that with your home computer. One of the most revolutionary aspects of Surface, though, is its natural interaction with everyday objects and technologies. When you place your wi-fi enabled digital camera on the table, for example, Surface ‘sees’ the camera and does something extraordinary: It pulls your digital pictures and videos out onto the table for you to look at, move, edit or send. Images literally spill out in a pool of color. The whole thing is remarkably intuitive, says Gates, because it’s remarkably similar to what people do in everyday life. “When you make it so that it's just visual — touch and visual — you're drawing on what humans are incredibly good at,” he said. “You know, what people have been practicing their entire lives. People will start to see that this world of information and entertainment is going to be far more accessible. The first place you’ll probably see Microsoft Surface is at one of its four inaugural retail partners, including T-Mobile USA, Starwood Hotels and Resorts, and Harrah’s Entertainment. AT T-Mobile, for example, you will be able to place any of their phones on Surface. Surface will sense the presence of each individual phone and then project each phone’s features in front of you for you to consider. If you want to add a feature in the store, just “push” that feature “into” your phone with your finger. Want to compare three phones? Four? Put them all on the table, and their respective features will line up next to one another, for your consideration. It’s safe to say computing will not look the same again. 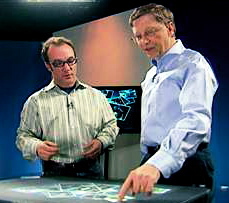 May 30, 2007 — Microsoft Unveils a New Project　｜Bill Gates gave TODAY's Paul Hochman an exclusive look at Surface, a table-shaped computer that responds to touch. その20年の間に、アップルの創始者スティーブ・ジョブズのビジネスライフにも、まるで『Lord of the Rings』のような波乱の歴史が続いた。しかしアップル愛用者は他のPCやMSには目もくれず、ひたすらアップルの機器を買い替えMacのOSを入れ直して、忠実にジョブズの次のプロジェクトを信じて今日までついてきた。これがいわゆる世間で言うところの「救世主ジョブズを信奉するアップル教信者」である。彼らにとって、ジョブズはほとんどビートルズのジョン・レノンの存在に近い。"The One and Only,...... and Ethereal."